Women United is made up of some of the most prominent and influential women in Central Florida, making comprehensive change in the areas of literacy and education. 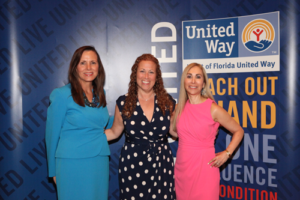 With the support of Heart of Florida United Way, the Women United hosts the annual Women United Luncheon, bringing together more than 1,000 guests to be inspired and take part in one of United Way’s most important fundraisers. While Women United has made great progress in helping Central Florida students, there is more work to be done. Last year’s event raised nearly $197,000 that was used to fund local education initiatives and helped Title-I Orange County schools receive an online reader program, impacting more than 6,000 students. This program gives students access to a digital library of books while building essential literacy skills, setting them on the path towards academic success. Our goal this year is to bring this love for reading to even more students throughout Central Florida. We are proud to present the 11th annual Women United Luncheon to our community. Together, Women United, Heart of Florida United Way and women leaders across Central Florida can make a significant impact in the lives of Central Florida students.